Queensland Government map with State coat of arms, 1963. Map showing locations of some of the State’s primary production industries, as well as the major transport arteries. Queensland the Sunshine State, 1973. Postcard depicting the State’s variety of natural fauna as well as various primary and tourism-related industries. 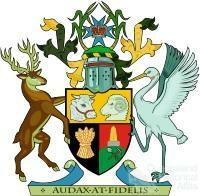 Queensland coat of arms, 1977. Queensland’s official coat of arms, the oldest State Arms in Australia, granted by royal consent of Queen Victoria in 1893. Plate from first Ipswich locomotive, 1877. Builders’ plates are affixed to locomotives and other rail transport to record when and where they were constructed. The Sunshine State, 1960. Queensland land of opportunity with unlimited scope for industry and Investment, 1960. 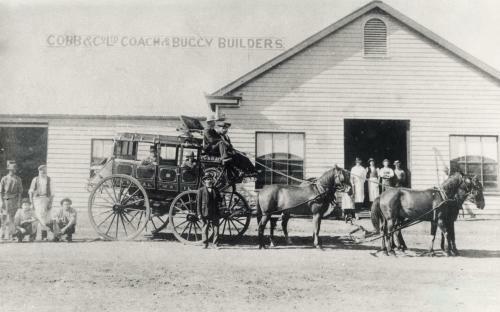 Cobb & Co Coach and Buggy Builders, Charleville, 1900. This factory was opened in 1888. Collection of the Queensland Museum, Cobb+Co.